A perfect Christmas present for anyone. 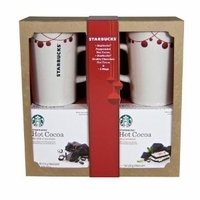 Starbucks hot cocoa gift set. Each gift set comes with 2 ceramic mugs, 1 1oz pack of Starbucks double chocolate hot cocoa and a 1 oz pack of Starbucks peppermint hot cocoa. A perfect gift for sharing. This is a perfect gift for someone who has everything after all everyone loves hot chocolate. Starbucks peppermint hot chocolate is a rich dark chocolate with a peppermint flavor. Starbucks double chocolate hot cocoa has real bits of dark chocolate blended in. Each mug holds 10.8 oz and is dishwasher safe.